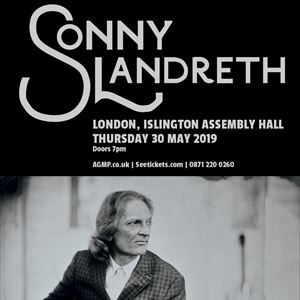 Virtuoso slide guitarist Sonny Landreth is back in London hot on the heels of his "Recorded Live in Lafayette" 16-song new album, his first live album in over 12 years. Son of Dave is Canadian Singer-Songwriter Benjamin Darvill. He moved from Winnipeg, Manitoba to London in 1998 and joined the award winning band Crash Test Dummies. His solo career as Son of Dave started in 2000 and is a mixture of Harmonica, Vocals and Beat Box which has been described as "Sonny Terry meets Bobby Rush" by Uncut Magazine. Son of Dave has released six albums to date and worked with Steve Albini and Martina Topley-Bird and appeared on "Later with Jools..." in 2005.